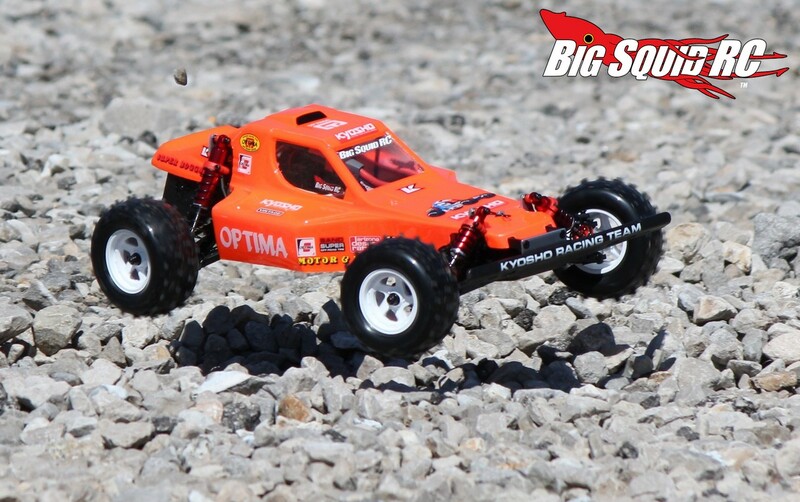 Kyosho Vintage Series Optima Buggy Review « Big Squid RC – RC Car and Truck News, Reviews, Videos, and More! Primary Competition: While vintage cars are making a comeback, there aren’t many in the Optima’s class. 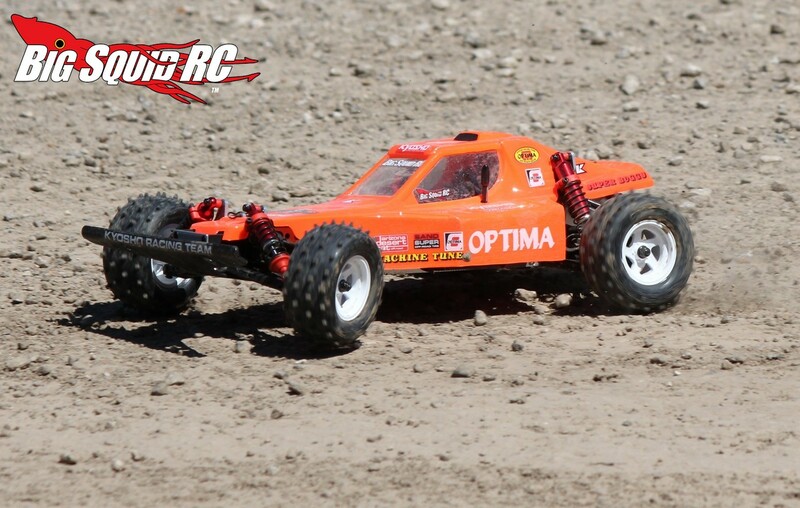 So, you can compare it to re-releases like the Associated RC10 World’s Car, or you can compare it modern day competition like the Associated B44, Losi 22-4, etc. What’s Needed To Complete: Because the Optima is a kit, you are gonna need several things to get it up and running. You’ll need electronics like a radio, receiver, steering servo, speedo, motor, battery, and charger. You’ll also need things like paint, CA glue, and various tools for making the assembly process easier. The Optima does come with a 4 way wrench, shock tools, shock oil, a pinion gear, and basic L-wrenches. Build Quality: As a kit, the build quality is all up to you. Take your time and build it right. Otherwise, we found the part quality of the kit to be very good. The plastic parts were well done, as were the metal parts. We didn’t have to mod anything to make the kit go together properly. Test Drivers: Hawaiian “Party Boy” Chris, Robbie G, Iron Mikeee, T-Money, and yours truly. 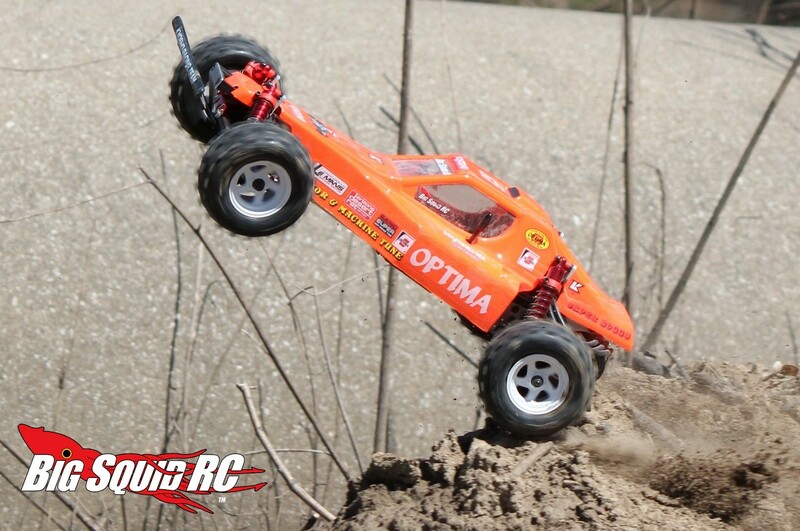 Test Venues: St Louis Dirtburners 8th scale outdoor track, two city parks in Arnold Missouri, a park in Belleville Illinois, and a CostCo parking lot. Set-up Notes: So here is what we went with for electronics… For control we used a Spektrum DX4S transmitter with AVC receiver. It was used so we could dial up the stability control on slicker surfaces and it worked like a charm. Steering duties were handled by a waterproof Hitec HS-646WP and Hitec also handled the charging duties with an X1 Pro charger. For a speedo we went with the buttery smooth TrakPower MS-1 and used a TrakPower 8.5 sensored brushless motor for plenty of power, without it being too much. Juice was supplied by a Duratrax 2S 5000mAh LiPo. All suspension settings were done to the book specs. We used the recommended shock pistons and the supplied shock oil. We settled on zero toe up front with 2 degrees of negative camber front and rear. Turning: Ya know, it had been a very, VERY long time since any of us had driven on Optima. Quite honestly, we expected it to not turn nearly as well as it did. With the stock settings, the front damping is very light, making the front tuck in hard on higher bite surfaces, which in turn made the rear of the buggy loose. It was quite obvious that the stock settings were for looser surfaces, as it turned quite neutrally on them. On loose gravel or on a dusty baseball diamond, the Optima had good steering with the rear keeping right in-line when doing fast or slow corners. Jumping: Once again the Optima did much better than we remembered or expected. The front shocks are light on damping and laid down at an extreme angle, thus creating a very sharp damping curve, but still the Optima did a decent job when hitting jumps. Btw, the Optima doesn’t use a center diff, so it responds quickly to trigger inputs in the air. On rutted jump faces its older school geometry doesn’t allow it to take off as predictably as new school buggies, nor can it be landed nearly as far sideways as a modern 4wd buggy. But, if you are a basher or a first time user, it doesn’t take long to get used to how it jumps and we were hucking it relentlessly in no time. Also of note, the stock tires are somewhat heavier than modern 4wd race tires, so we found it much easier to pull off backflips with the Optima than we had expected. Bumps/Whoops: Ok, so with all our testers being used to modern suspension technology, the Optima definitely showed its age in the rough. It would tend to swap around when the going got rough and the front suspension blew through its travel quite quickly. However, the spring rates felt right in the ballpark and with some slight changes to shock oil, front pistons, and front shock angle, its handling in the rough could easily be improved. On-Road: Did we mention that the old school design of the Optima also places its weight significantly higher than a modern race buggy? That was actually most noticeable when driven on-road where the Optima would traction roll at times we didn’t expect it to. Was that a really bad thing? We don’t think so, when you buy a vintage buggy, you are paying for it to handle like “back in the day” and the Optima gives you an accurate feeling of what it was like to drive higher CG buggies from that era. 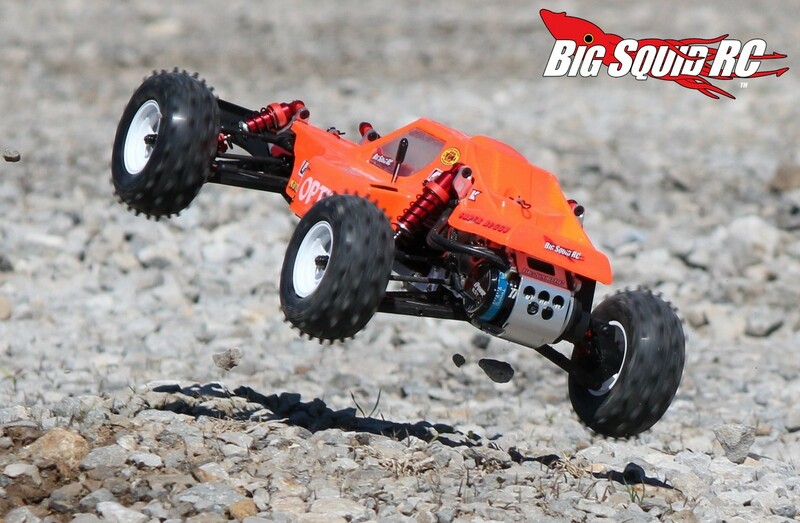 Grass: Ok, so big spiky tires, combined with 4wd that did not come with a center diff, plus solid brushless power, equals a buggy that can get through the grass fairly well. 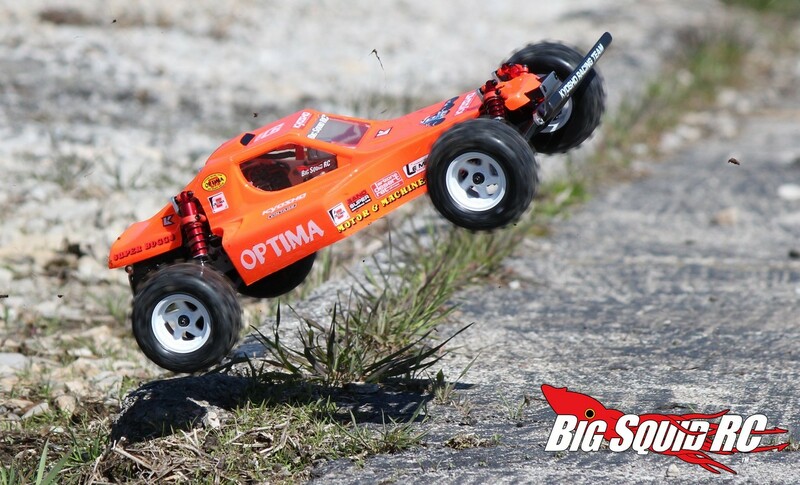 No, it could not blast through taller grass like a monster truck could, but it was VERY impressive for a 1/10th scale buggy. 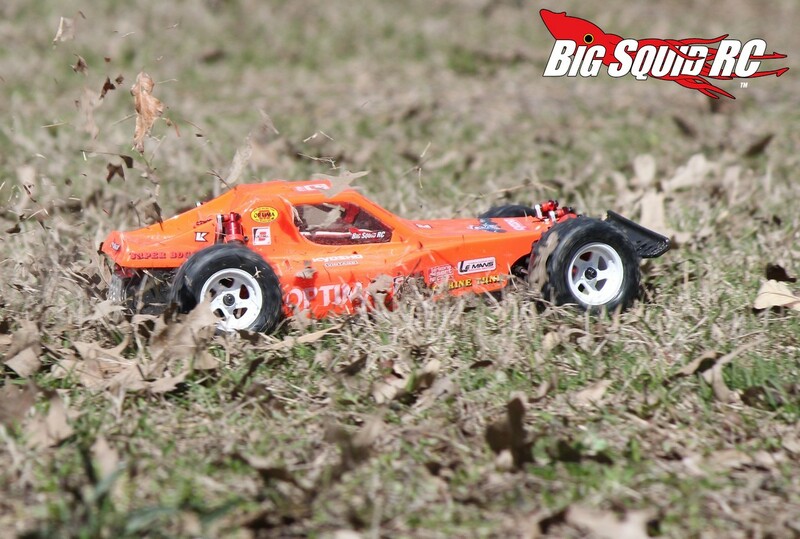 In fact, it was probably better at getting through grass than any 10th scale buggy that we’ve ever tested. Tires: So, about those tires… A whole lot of people back in the day would have given just about anything for the Optima’s tires. They are VERY soft, incredibly so compared to tires from the Optima’s era, and come with decent foam inserts. They worked “ok” on loamy surfaces, “not bad” on hard pack, and “surprising good” on pavement, but would have totally changed the game back in the day. Sure, there are better modern tires on the market, but for an old school look, they totally rock. 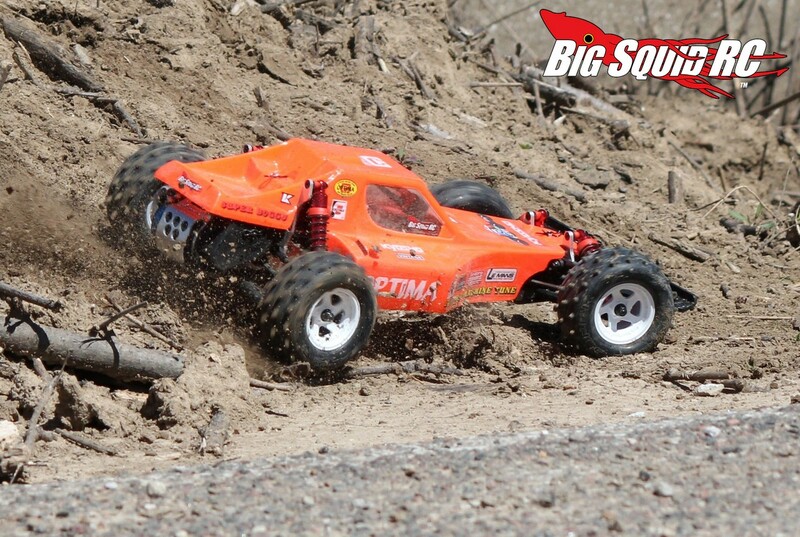 Broken Parts: Ok, so a couple of our testers raced a lot of 4wd buggy back in the 1980s. They both remembered just how fragile the cars were back then, especially in the 4wd class. 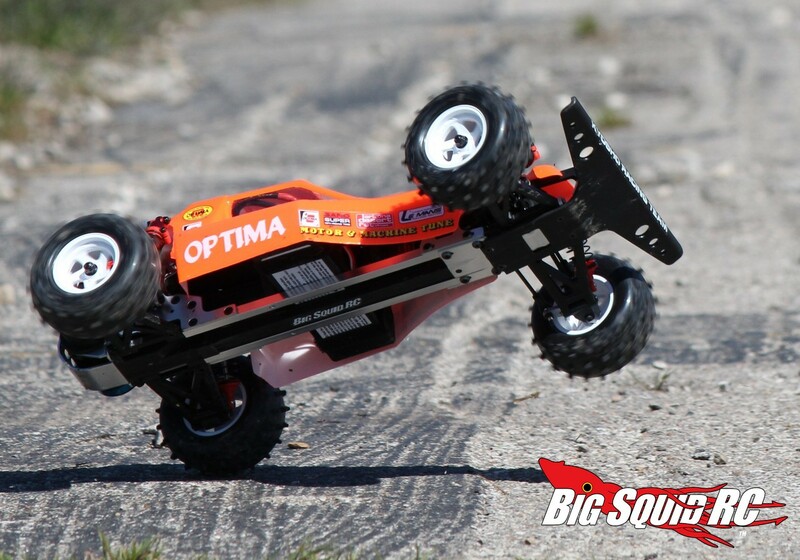 Heck, even the modern day 4wd tenth scale class can show you how easy some cars break. Any which way, we were not expecting much in the way of durability from the Optima, but boy did it prove us wrong. 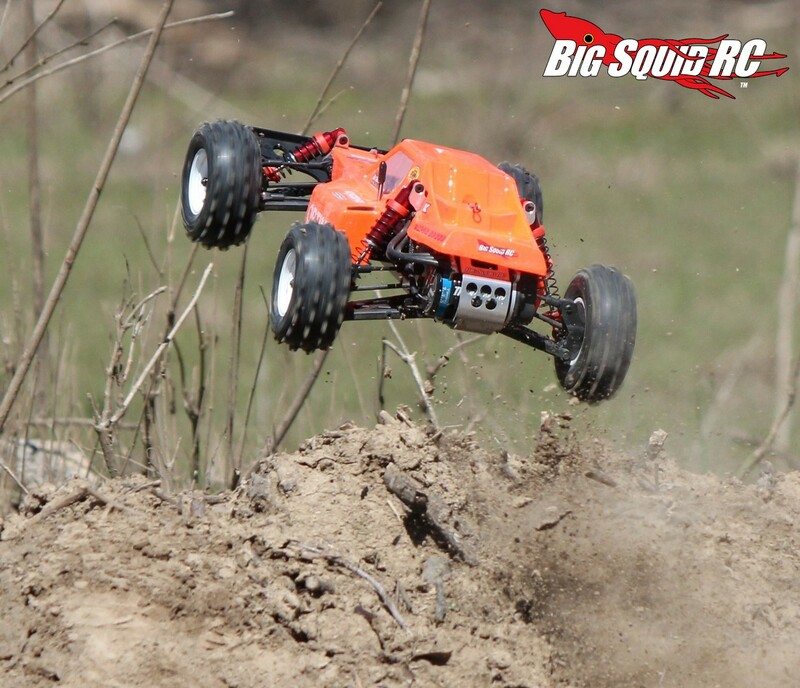 The minor changes that Kyosho made to the re-release have changed the buggy from one where you might finish most races, to one where you can do some roof jumps and slam some hard objects and still drive away. In fact, we had to bash the Optima pretty dern hard before we could finally get it to break. We did some of our normal idiot driving and it didn’t break. Then we did a pair of roof jumps and it didn’t break. Then we started hucking it off a ramp to pavement, and it still didn’t break. Finally we landed at a really odd angle on a ramp jump to pavement and broke one of the front hub carriers. Because the Optima doesn’t use a center diff, it still drove reasonably well with just three wheels attached and we were having wayyyy too much fun to stop, so we kept on bashing it. 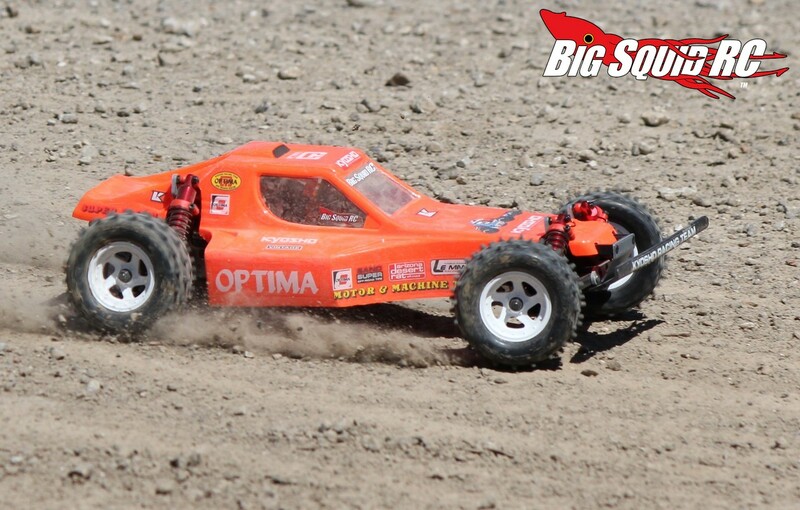 In the end we managed to break the hub carrier on the other side to end the day, but overall, the Optima will change how rugged that you think an old school tenth scale 4wd buggy can be. We were SUPER impressed. As mentioned in our build-log, the Optima went together really well. Even if you are a first time builder, if you pay attention to using the proper length screws, pay attention to proper orientation of the parts, and look very, VERY closely to make sure you build a step just like the diagram illustrates, you will have no problem with the build. So what did the Optima really drive like? Hawaiian Chris was very impressed. He had never driven one back in the 80s and was amazed how well it drove compared to a modern buggy. 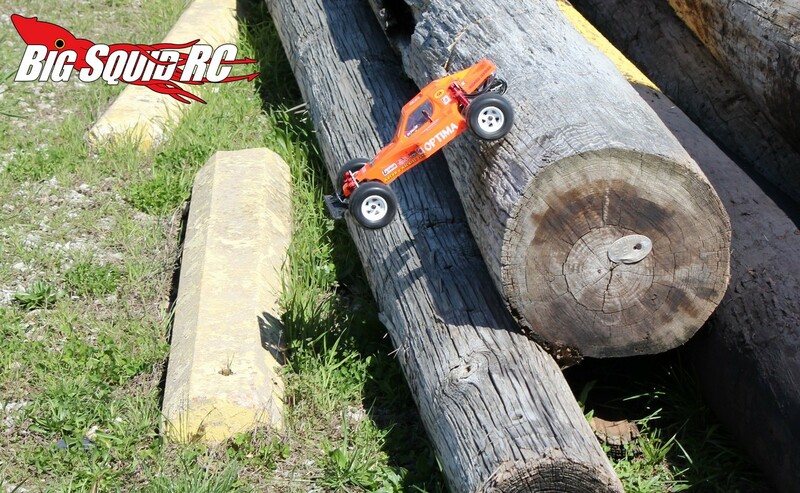 Our “pro guy” Tim was also really impressed, the soft tires and decent stock suspension settings had the buggy working respectably well on loose surfaces. Even Iron Mikeee, the one guy in our crew that pretty much hates buggies, was left wanting to buy one after driving the Optima. In my personal opinion, with proper set-up and tires for most local tracks, I feel a good driver could still do very respectably with the Optima, which goes to show what a good design it was from all those years ago. Btw, the Optima comes with two different front bumpers, a super wide and a narrow. We of course installed the wide for more protection while bashing and it worked very well. The Optima also gives you the option of running chain or belt drive. Also of course, we went with the more old school chain drive. Yes, chains love to stretch, but there is just something about the sound they make, we just couldn’t resist. When choosing a power system, we didn’t want to bolt in too much power and destroy the drivetrain, but we wanted enough to make it as fast, or faster, than what it would have used back in the 80s. We went with an 8.5 turn TrakPower and it felt about perfect. It gave our buggy a 37 mph top speed, which would have been insanely fast back when the Optima originally came out, and the drivetrain on the Optima handled it just fine. Best Mod: The first mod we would do is to start experimenting with heavier front shock oil. It is a cheap mod, but one that will help the Optima handle better in pretty much every condition. 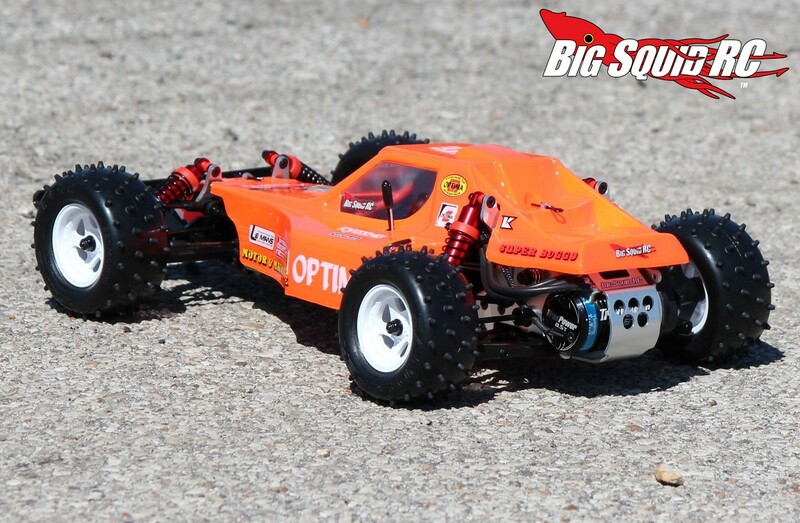 Time To Bash: B Ok, so kits definitely aren’t the fastest way to hit the track, but the Optima went together as well, or better, than any kit we’ve built here at BigSquidRC. Workability: C Old school cars are notorious for being a pain to wrench on, but the Optima isn’t as bad as many of its competitors from that era. Yes, it is harder to wrench on than most modern buggies, but it doesn’t have any glaring area that is especially rough to wrench on. Car Show Rating: A This is a hard one to judge. 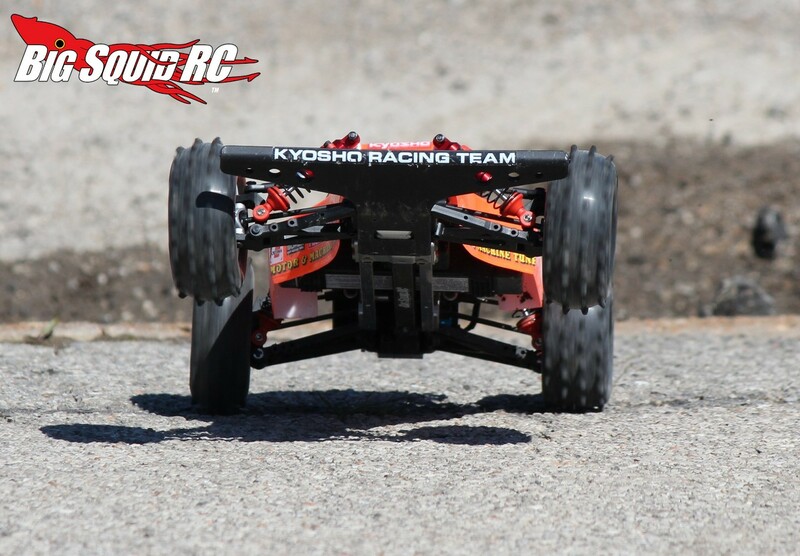 For what it was intended to be, a vintage race buggy, our reviewers felt it looked awesome. Certainly that is not a look that everyone prefers, but if you are into vintage, you’ll love how the Optima looks. Bash-A-Bility: B Amazing! All of our testers were amazed at how well the Optima held up. You can actually bash the Optima without it falling apart. Sure, more extreme bashing will get it to break, but overall we were super impressed with its durability. Fun Factor: A While none of our testers are into the old school race scene, every one of our guys that drove it had a blast. They loved how it gave an old school feel when blasting over whoops, they loved how the chain sounded when pounding the throttle, and they loved how hard the buggy could be driven without breaking. 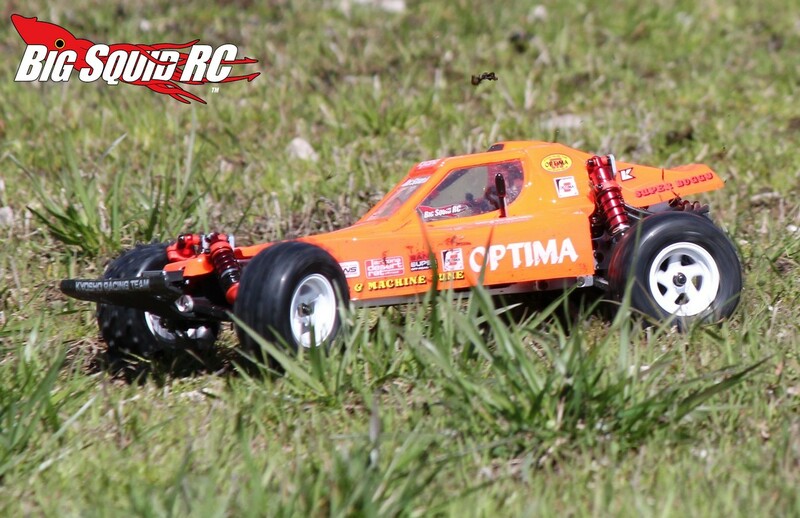 Handling: C Sure, there are lots of modern buggies on the market that turn and jump better than the Optima, but the Kyosho gives a true old school ride that you vintage nuts are after. Value: B At a $299 price point we felt the Optima was a high quality kit that will give new owners a sold bang-for-the-buck. Parts Availability: C Now here is an interesting category (LOL). With Optima parts being on the market for over 30 years now, you can definitely find them in places that would not expect. However, most local hobby shops don’t have a large selection of Optima parts, thus the reason for the C rating. 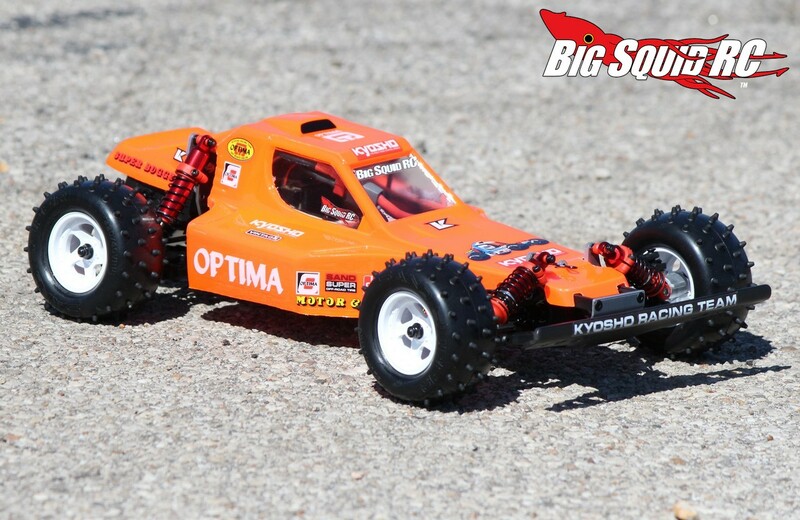 BigSquid Rating: B While the Vintage Series Kyosho Optima isn’t for everyone, we found it to not only be a high quality kit, but also a blast to drive. Even drivers who aren’t into the whole vintage scene were found begging to get another shot at the controller. Heck, it basically left everyone who saw it wanting one, which is about the highest praise that we can give a car. 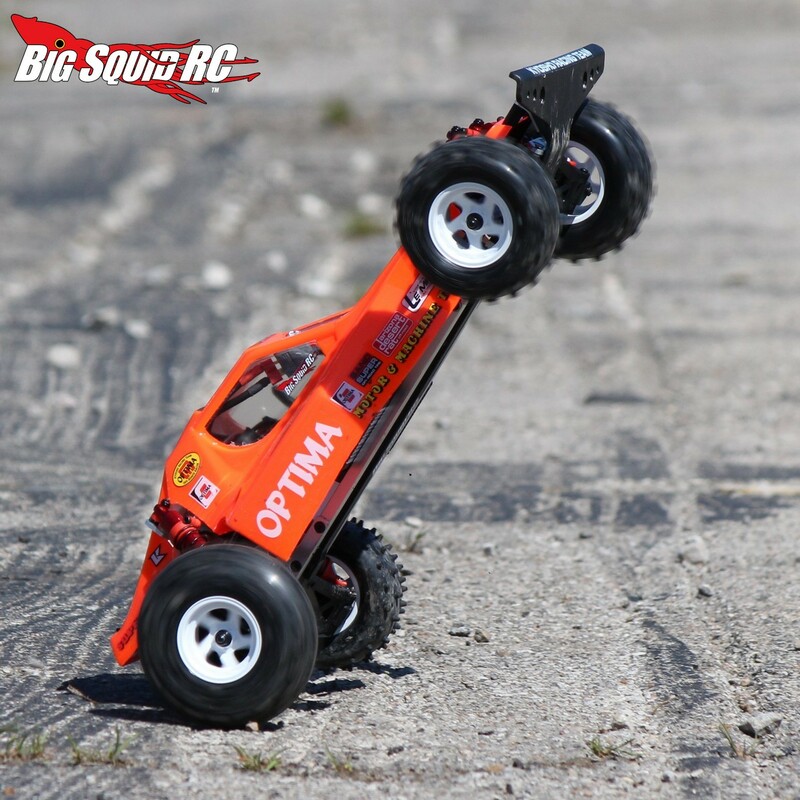 So yes, the BigSquidRC Bash Crew can definitely recommend the Optima to you.